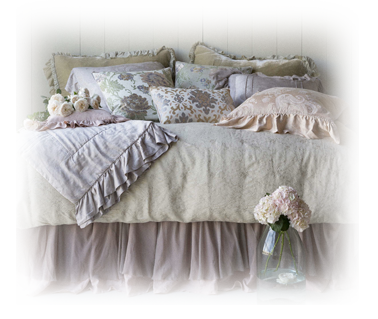 Bella Notte Linens represents the finest luxury bedding made with washable velvets, silks, linens and cotton fabrics. Designed to be mixed, Bella Notte bed linens are offered in numerous varities of designer color palettes, fabric styles and different textures so you can create your own custom bedding ensemble. At Peace, Love & Decorating, our experienced interior design staff is happy to assist you with fabric, style and color selections from the large array of Bella Notte options. While certain bedding styles are offered on a quick ship program, most Bella Notte bedding is custom made to order so please allow six to eight weeks. Truly luxury bedding and definitely worth the wait!